The United States trek towards international relevance is getting shorter and shorter, which was helped on massively by Christian Pulisic’s eruption onto the European stage, but the Dortmund product doesn’t appear to be a mere flash in the pan. There are numerous young, talented American players coming up through the ranks hitting their formative years with some rather big clubs. And PSG is certainly a big club. The French giants are capable of purchasing anyone under the sun, but they also have an academy that has churned out the likes of Nicolas Anelka. 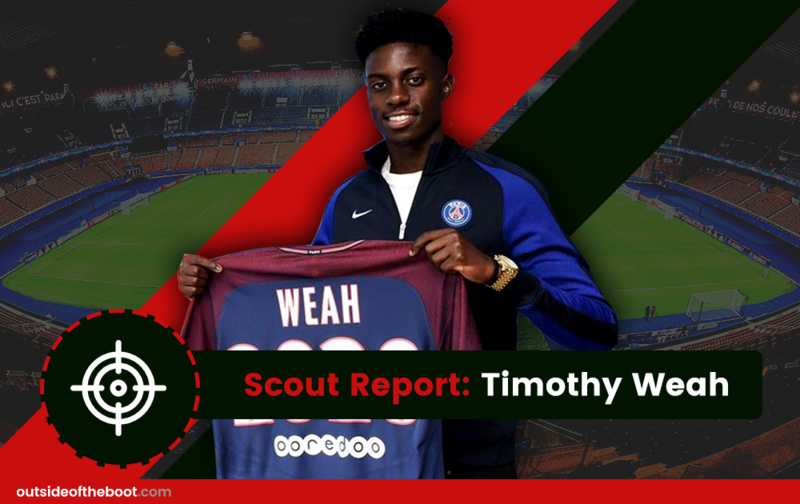 They will also be hoping that one of their more recent academy investments can reach similar heights – the young American forward, Timothy Weah. Timothy Weah was born on 22th February 2000 in Brooklyn, New York. There is something to be said about world class pedigree, and Weah certainly has one. He has the pleasure of calling former Balon d’Or winner George Weah his father. George, a Liberian, is the most successful African footballer of all time, earning the honor of being named African Footballer of the (20th) Century. He spent time at numerous top-tier clubs, including Monaco, Manchester City and, naturally, PSG. So, Timothy has a lot to live up to, to say the least, but he is off to a good start. Being the son of George Weah, he was always exposed to soccer and quickly found a love for kicking the ball around. He started his footballing career at Rosedale Soccer Club in Queens, New York. However, as his family were frequently on the move, they soon landed in Florida, where Weah picked up competitive action with West Pines United F.C. When he turned 10, the family was back in New York and he got his big start, with U.S. Soccer development club BW Gottschee. It was then off to the New York Red Bulls Academy before several trials landed him at PSG in 2014, where his father had been about twenty-five years earlier. He is a potent attacker with the PSG U19s, scoring four goals in six appearances across the past two years of UEFA Youth League competition. Weah’s international career is in a similar fledgling state, but the early results are nothing but promising, as he is turning in consistent, influential shifts with the United States U17 side, scoring two goals and adding an assist in his first eight appearances with the red, white and blue. Weah went into the U17 World Cup in India with a lot of expectations to be a prime attacker and he looked every bit up to the role. Weah is classified as a center forward, but his wing game is so developed that you might as well just call him a general attacker, mostly because he is so good at creating from wide angles. The young American can be found bursting up and down the touch line with his superb speed, but he also possesses the rare ability (at least for youngsters) to stop those runs very early, sometimes just past the halfway line, and sending in pinpoint-accurate early crosses as if it’s an easy thing to do. There is no distance too great for a good old-fashioned Timothy Weah cross. As any good attacker should, Weah can also mix in a bag full of independent, defense-wrecking moves with his passing ability. His dribbling skills, paired with his speed, can eviscerate opposing defenses. Weah is an intelligent attacker with a remarkably cool head. He never shows any emotion and never gives away his thought process, which makes him deadly when debating between pass or dribble because defenders don’t know what to anticipate and often get caught guessing as a result. Weah is also incredibly unselfish. When presented with the chance to score or pass to a wide-open team mate for an even easier goal, he will, nine times out of ten, dish it to his team mate. This stems from his pass-first mentality when attacking. With his versatility to play across all attacking positions and his accompanying versatility within each position to attack the defense in so many different ways, Weah’s skill set is a wide-ranging arsenal of tools. Weah’s primary strength is his passing ability. This is a man who thinks pass first and it’s clear why he does that. He can drop long, arching passes from straight or wide angles onto the toe of a team mate in the box with ease. From the moment he crosses the halfway line, his ability to cross is unlocked, which has to give fullbacks fevered dreams as they lay awake at night thinking of the match-up ahead. His speed, too, is a cause for fits of panic from the opposing side. Weah has a quick burst ability that allows him to flex his acceleration around defenders who aren’t so blessed with pace. Spoiler alert: few defenders can match his pace, and that won’t change as he grows into more competitive arenas. Naturally, no self-respecting speedy attacker would be caught dead without dribbling ability, which Weah also has in abundance, just like his old man. It’s in his calmness and composure that his dribbling really shines, because his mental fortitude gives nothing away in the process of his attacking. Weah is classified as a centre forward, but his weakness may simply be that this position does not suit his strengths quite as well as playing from wide angles. He is a master passer, but even moreso from the wings, which is obviously lost when he’s the one that’s supposed to be receiving the crosses, rather than the one delivering them. Weah is good in front of goal, but it’s secondary to his ability to create. As such, he may be creating his own weakness if he persists in being a center forward first. He does have his strengths as a center forward, as he has just as cool of a head in front of goal as he does everywhere else on the pitch, but his play from the wings is what makes him really pop.